AUSTRALIA'S beef capital is set to sizzle like a steak on the barbecue unless a dramatic intervention occurs, according to a progressive Australian think tank. 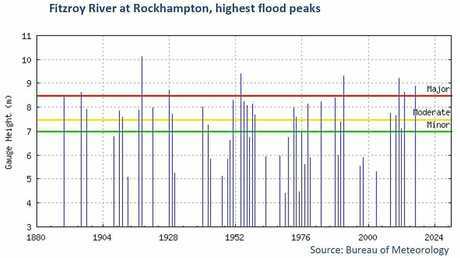 The Australia Institute has crunched the Bureau of Meteorology's data and CSIRO predictions to paint a grim picture for the future climate of the Rockhampton region. 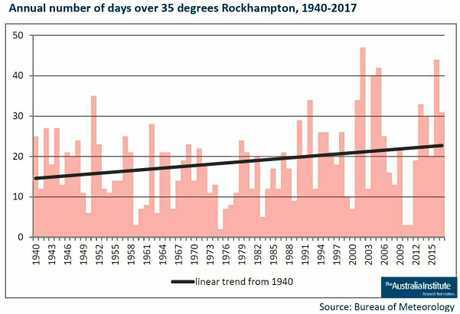 Their research discovered that the number of days over 35 degrees has nearly doubled in Rockhampton in recent years and unless there was a strong policy response to climate change which focused on reducing carbon emissions, Rockhampton would bear the brunt of negative weather conditions including more droughts, fires, floods and triple the number of days over 35 degrees. 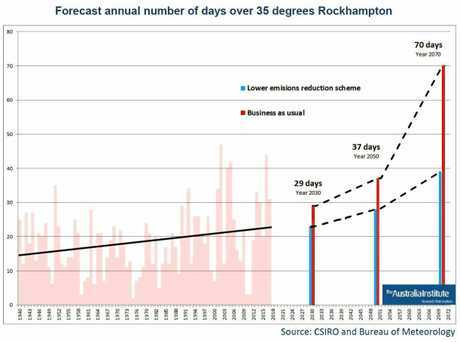 The Australia Institute's Heat Watch initiative predicted that by 2030, Rockhampton was expected to endure 29 days over 35 degrees and by 2070 almost half the days of summer (70) would be scorchers. 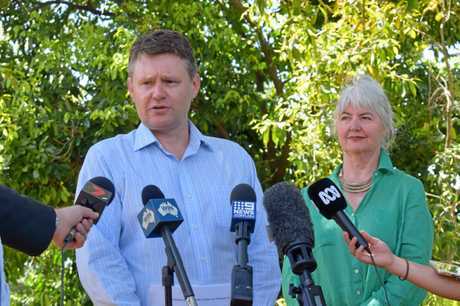 The Australia Institute's principal advisor Mark Ogge said yesterday that the extreme heat due to climate change would have a devastating impact on the Rockhampton region. "There will be an increase in heat related deaths, agricultural productivity will be hit hard and people's quality of life will plummet,” Mr Ogge said. "Even more alarming is the combination of increased extreme heat with high humidity levels, which reduces the ability of the human body to cool itself. Mr Ogge said Queensland made a significant contribution to global levels of carbon emissions by not only burning coal and gas but exporting it to other countries. "The silver lining is that this isn't inevitable if we do reduce emissions by a significant amount, impact will be much less,” he said. 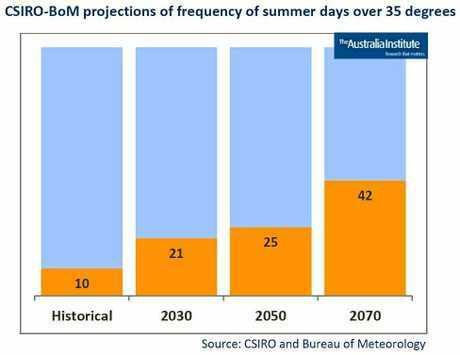 If decisive steps were taken now, Mr Ogge said by 2070, the number of days over 35 degrees would be half what they would otherwise be. 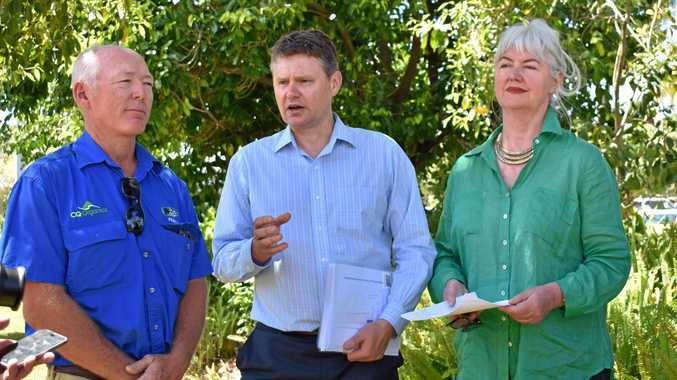 "Given the vulnerability of Rockhampton to climate change, strong emissions reduction policies are in the state's interest,” he said. By transitioning towards renewable technology, scaling back our fossil fuel exports and calling for global action, Mr Ogge said we could reduce the impact of climate change on future generations. "When coal and gas exporters reduce their exports, the price goes up and there's a greater drive for replacing it with renewable energy,” he said. "Renewables are already cheaper than coal and gas. "I think we need to start winding back the industries that are adding to this problem and phase them out over time. 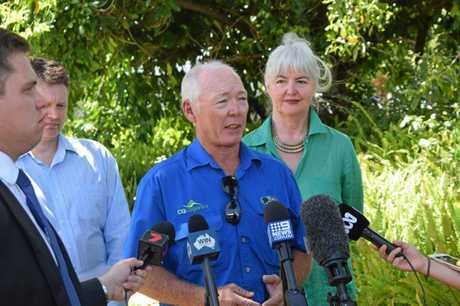 He said it was fortunate that Queensland was in a strong position to reduce, implement, and benefit from strong climate and energy emissions reduction policies with the state's renewable energy target set to drive renewable energy development to reduce emissions, create jobs and bring other economic benefits. Local beef farmer Mick Alexander said some of the biggest climate issues they were facing in Central Queensland was the increased rate of evaporation of water storages and the impact of hot conditions on cattle where they were unable to cool down, were drinking more water and had less shade due to vegetation clearing. "Climate change is causing extremely hot summers and even unseasonably hot winters are forcing us to rethink paddock layout, tree retention and even man-made shade structures to reduce heat impact on livestock,” Mr Alexander said. Mr Alexander said he would like to see a more concerted effort to re-vegetate the environment to capture the carbon from the air.